If you are planning to hit the road for Thanksgiving, you’ll have plenty of company. Road travel is expected to be very high this year, bolstered by favorable gas prices right now — according to AAA, this week started off with a national average price for a gallon of regular gas of $2.885! When do we go? 36% say their Thanksgiving travel begins on Thanksgiving Day. 30% said it starts the day before; 18% say they’re hitting the road 2 to 3 days before. What about the return trip home? 25% say they’ll fight the tryptophan malaise and drive home later on Thanksgiving Day; but the majority, 42% say they’ll wait 2 to 3 days and drive home Saturday or Sunday. 22% of us expect to hit the road with a fresh start the next morning. How well prepared are we? 95% of respondents have a smart phone. 52% say they use 2 to 3 travel apps for their Thanksgiving travels; 34% will actively use 4 or more apps. Google Maps examined the traffic conditions over the last 2 years for 21 cities in the U.S. and translated that data to travel tips for those of you who will be on the road: the best day to travel? That would be Thanksgiving day itself. Google offers tips for days to avoid, the best time to set out, the best times to travel home, and more. 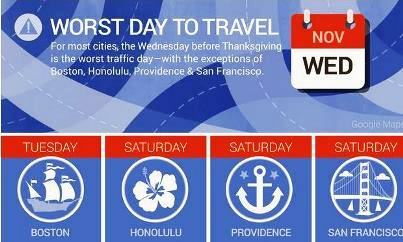 See the full list of Google Thanksgiving travel tips here – we’ve excerpted a few infographic-style tips below. We were captivated by the Arctic rescue of scientists and tourists from the icebound Akademik Shokalskiy. See some fascinating photo galleries by Andrew Peacock of the Australian Antarctic Expedition, Reuters here and here. It reminded us how often unplanned circumstances can make for “memorable” travel adventures. We came across one story about just such unplanned events that we found both amusing and appalling: Poop cruise! And 30 other outrageous travel stories of 2013. The title refers to last year’s nightmare cruise in the Gulf of Mexico. The poor passengers first had to suffer an onboard fire, a terrifying experience that resulted in the loss of all power. It took the crippled boat 5 days to drift into port: 5 long days with thousands of people stuck on a ship with no electricity or working toilets. The horror! If you are planning any vacations for a mid-winter break, we hope these stories won’t put you off. Unplanned “adventures” can happen at home or abroad – that’s what insurance is for. Consider protecting any costly travel plans with some trip insurance. It may not protect you from unexpected encounters with penguins, poop, or other problems, but could help to minimize any associated risks should havoc ensue. The Insurance Information Institute offers a good rundown on the major types of travel insurance: including Trip Cancellation, Lost Baggage, Medical, Dental, Emergency Evacuation, 24 Hour Traveler Assistance, Baggage Delay, Travel Delay, and Accidental Death Coverages. Some policies also have options for Collision/Damage coverage for rented cars. And don’t forget – when going on vacation, there are some steps you should take before leaving: Going on vacation? 5 steps to secure your home while you are away! Why not stay local this summer and enjoy all the treasures that New England has to offer? We’ve compiled some tips & tools to get you on your way. First and foremost, before you hit the road, check Gas Buddy and fueleconomy.gov to get the best gas prices. And make sure that your car is in tip-top shape: Consumer Reports offers a great guide to summer road travel with tips for family travel, maintenance and vehicle prep, fuel economy, travel gear, safety & more. Find New England Beaches, Whale Watching tours and some great cycling routes – all these, and many more ideas at Discover New England. Yankee Magazine is a local favorite with great information and ideas for local travel and events. Eat healthy, eat local by finding the best New England Farmers’ markets – pair your veggies with some seafood – here are the 5 best tips for cooking lobster at home. On the road, check out some “only in New England” landmarks – or just explore the Best of New England with the 2013 Editor’s Choice Awards. If you want to leave the car behind and go by foot, check out Hike New England to explore more than 200 trail reports for detailed guides that include a description of the hike, trail distances, a difficulty rating, and driving directions; often photos or trail maps are also provided. Boston.com offers 25 things to do under $25 and many other ideas in Explore New England. If your travels include your pet, check out pet friendly New England lodgings. The Boston Globe recently highlighted a pick of pet friendly choices in New England. Get more pet-friendly trip help from Boston.com. Have safe and fun wanderings – and don’t forget to load your insurance agent’s telephone number in your mobile phone, just in case!